The Clements Library at the University of Michigan owns the papers of Gen. Thomas Gage (1719-1787), last royal governor of Massachusetts. Because of that custom, Gen. Gage’s correspondence with his superiors in London, his intelligence notes, and other important documents went home with him after he sailed away from Boston in the autumn of 1775. He had a house in London and also spent time at the family seat, Firle Place. Before he died, Gage answered questions about the American War from the historian George Chalmers (1742-1845), but he appears to have relied on his memory and impressions rather than consulting those papers. He never published self-serving arguments that he was right all along like some of his successors in the American command. Gage appears to have preferred to leave the that part of his life completely in the past. So his papers remained packed up. William L. Clements was fortunate to purchase the papers directly from General Gage’s descendants. Not only was their provenance perfectly documented, but the papers were even shipped from England to Bay City in the same twelve military document trunks in which they had been filed during Gage’s command and then sent to England in 1775. 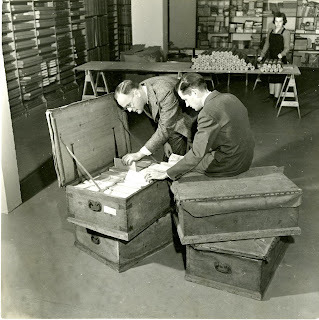 In 1937, following the settlement of Clements’s estate, the twelve boxes full of documents arrived at the Library in Ann Arbor. The Gage Papers were mounted and bound to make them accessible to researchers. But what of the trunks? 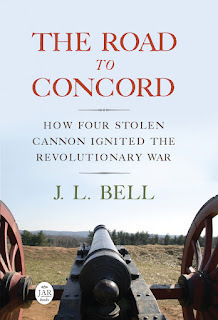 Each is a significant artifact of the American Revolution that had spent its days in America at the epicenter of the British command. Unlike the letters and documents, however, the twelve trunks were “realia,” (three-dimensional objects). To many archivists they were of little or no use in a research library. Over the twenty years after their arrival at the Library the trunks were gradually dispersed until only one remained. Even that one had been given away but was later returned to the Clements. This lone box appeared to be of a standard design, 32 x 21 x 12 inches high, constructed of sturdy pine planks dove-tailed at the corners with wrought iron hinges and handles and a lock. The lid is covered with a sheet of canvas painted in “Spanish brown” (a reddish brown color) to repel water. The rest of the box is painted the same color. On the lid, spelled out in upholstery tacks is the message “Secty Off / N 7 / 1770.” We have interpreted this to mean “Secretary’s Office, Number 7, 1770.” The seventh year of Gage’s actual appointment as commander was 1770, which might explain the number and date. Coincidence? Inside is a level of built-in pigeonholes with 14 slots (2 x 7). Above this is a removable tray with another 14 slots. Small paper labels once identified the contents of each box. Putting out a call to the Ann Arbor community brought out two more trunks, similarly constructed and marked. That means nine of Gen. Gage’s trunks are still unaccounted for.